Katie Reddin-Clancy’s play about gender fluidity and performance sounds really intriguing. 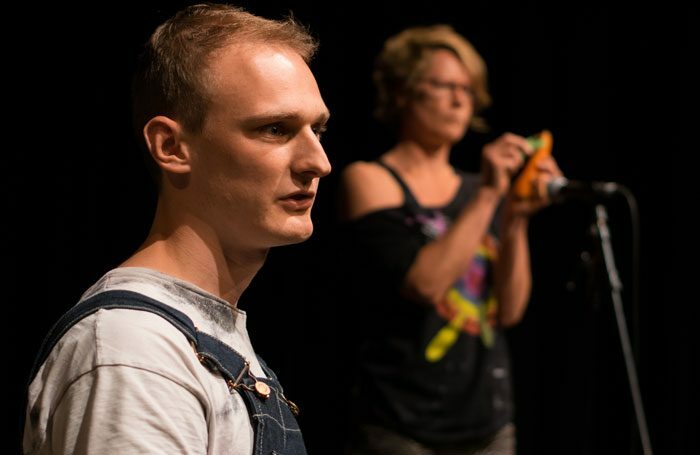 As with last year’s Edinburgh Festival Fringe, gender identity and its complexities is one of the key themes in Brighton and this play about a comedy double-act is one of a large number of shows tackling the subject. Part of Window, Brighton Fringe’s arts industry showcase, Anima Theatre’s show uses the testimony of Syrian refugees to tell the story of an encounter between a British writer and a foreign woman on a sleeper train. Side note: the Rialto has a lovely bar. This tender gay love story set in the world of boxing was a hit with our critic at this year’s Vault Festival. It’s playing one of Brighton’s most consistently interesting venues – dedicated LGBT theatre the Marlborough. The Stage called it “a slick and sympathetic exploration of gay love in a homophobic environment”. YesYesNoNo’s show about sexuality and self-discovery was one of the finds of last year’s fringe, a promising show from a company with potential. The Stage called it a “messy, makeshift, but surprisingly satisfying experiment in self-disclosure”. Performance artist Mamoru Iriguchi, called one UK theatre’s “most ingenious figures” by The Stage, presents a new piece about gender identity performed with his usual inventive multimedia DIY aesthetic at the Marlborough Theatre. Following hugely successful runs at last year’s Edinburgh Fringe and at Soho Theatre, Rebecca Biscuit and Louise Mothersole bring their exuberant and extremely entertaining hymn to Dolly Parton, cloning, celebrity culture, and the inevitability of decay. The Stage’s Rosemary Waugh was very taken with Dirty Rascals’ show when she saw it at Camden People’s Theatre’s Sprint Festival earlier in the year. Taking the form of a TV game show, this devised piece explores public shaming in an online world. This comedy from duo Willis and Vere was another one of The Stage’s highlights from this year’s Vault Festival. Fergus Morgan called it a “smartly plotted metatheatrical farce” in his four-star review. The Brighton Fringe has a particularly strong cabaret programme. Among the cabaret highlights this year, Christopher Green’s country music alter ego Tina C, one of the winners of the 2017 Brighton Fringe Award, performs a new show about Trump and the patriarchy. Poet, storyteller and performer John Osborne presents a trilogy of shows including immense fringe hit John Peel’s Shed, recent piece Circled in the Radio Times and a new work about dementia, You’re in a Bad Way, the latter can be seen on June 3. Actor Ed Eales-White was one of many good things in Jon Brittain’s Olivier-winning Rotterdam, bringing warmth and emotional complexity to what could have just been a secondary role. He stars in Clare Rebekah Ponting’s one-man play.